Give your whole body what it craves. Introducing the complete Skin Food Experience, inspired by our best-selling Skin Food Original Ultra-Rich Cream, formulated in 1926. Now you can drench your skin with the new, rich Skin Food Body Butter, illuminate your face with Skin Food Light Nourishing Cream and smooth your lips with Skin Food Lip Butter. The new Weleda Skin Food collection contains aromatic plant extracts of Pansy, Chamomile and Calendula, which nourish skin from head-to-toe. As seasons change so does your skincare routine. Depending on the heat or the cold, the humidity or the wind, the different parts of your skin have different needs. The new Skin Food Light Nourishing Cream is a more fluid version of the Original. It’s vibrant, plant-rich extracts invigorate your senses while feeding dry skin a dose of moisture. The creamy formula, in a skin-nourishing base of sunflower seed oil, lanolin, beeswax and shea butter, is quickly absorbed to intensively hydrate. Weleda Skin Food Light Nourishing Cream is perfect for warm, humid weather or when your skin is oily. It’s also great as an everyday facial moisturizer and can be layered with other Weleda products or before makeup. For when a moment of self-care is needed, this soft whipped butter melts onto skin leaving it soft, glowy and touchable. Perfect for all seasons and all over hydration, the plant-rich formula is rich in sunflower seed oil and shea butter making your entire body irresistibly luminescent and intensely moisturized. Especially nurturing for self-care after dry-brushing, a bath or shower to capture moisture and indulge the senses. Nourished, kissable lips are always in season. The new Skin Food Lip Butter is the perfect plant-rich blend for your lips. It intensively nourishes and moisturizes even the driest lips—during cold or dry weather – or before make-up application for a smooth, even palette. Formulated with an essential oil blend of beeswax, pansy, chamomile and calendula to leave lips feeling soft and smooth for a kissable finish. The intention of the Weleda Skin Food Experience is complete nourishment. Food for your skin while harmonizing your body, mind and spirit. The nourishing base of each product is a potent composition of pansy, sunflower seed oil, calendula, lanolin and beeswax for intense, concentrated moisture. Other botanicals play their roles according to the needs of skin’s different aspects. We’ve partnered with TerraCycle® to bring you a free Skin Food Recycling Program. Now, you can recycle all of our Skin Food empties on us! TerraCycle®’s mission is to “Eliminate the Idea of Waste”. They specialize in making new products out of used products. You buy it and recycle it. They’ll turn it into a new product with a new purpose. Each Weleda Skin Food product has a distinct composition of aromatics, essential notes of orange, lavender and warm vanilla that come forward to rebalance your mind and spirit. Unlock nature's best kept beauty secret. Green beauty expert and celebrity makeup artist , Katey Denno uses Skin Food to create a healthy-looking glow. Just dab a few spots on your cheekbones, brow bone, cupids bow to create a fresh, dewy look. Skin Food is a universal savior of dry, rough skin on faces, elbows, hands and feet. 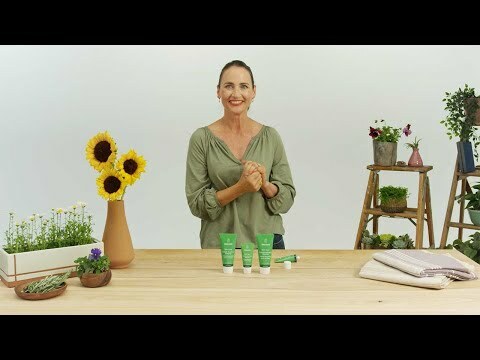 Clean beauty professional, Deanne explores the nourishing benefits and multi-purpose uses of the Weleda Skin Food Original Ultra-Rich Cream. Discover more about the new Skin Food Experience line here. Discover what Allure has to say about the new Skin Food Experience! Discover why our Skin Food line uses sunflower seed oil.